In 1987, PSD placed its first order for a Denver Orion 150x100E slurry pump. 30 years and a few orders later, PSD celebrated taking delivery of its 199th, 200th & 201st pumps from Metso UK. 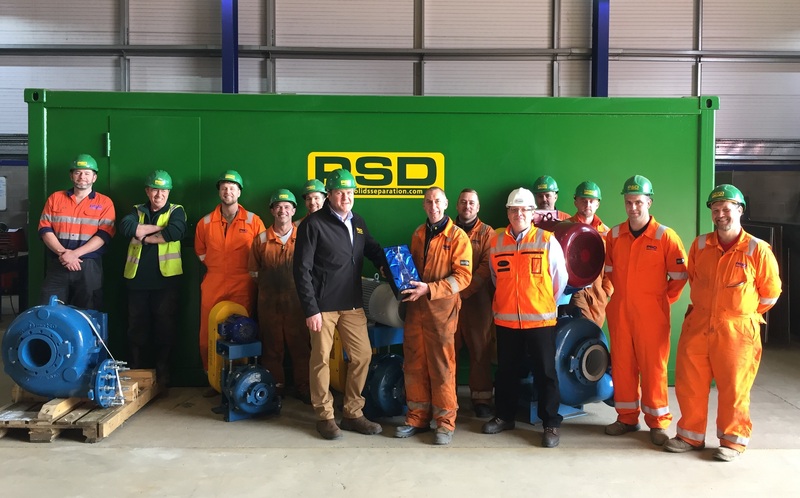 John Perry, Greg Dixon and John Dawson of Metso UK visited PSD's plant yard and presented PSD with an engraved decanter to commemorate the 30th anniversary of the relationship. John Perry, Metso UK's Services & Support Manager thanked PSD for their continued custom and looked forward to the next 30 years. Michael Rowlinson, PSD's Operations Director said "It means a great deal to us to have good relationships with our suppliers and this is something that Colin Pigott has instilled in the ethos of the company. We thank you for your support and look forward to many more years of working together."